Small - $44.99 Only 1 left! Large - $44.99 Only 3 left! X-Large - $44.99 Only 2 left! Ho ho ho. So, it's time to get the whole family squished into the sleigh for the trip to the annual Christmas get-together. Ain't nothing to get fraught about! It's gonna be a great X-Mas party, and one that's a ton of fun, we're sure. And don't sweat getting the kids dressed up either, because we've got just the solution. Slip your child into this Boy's Green Christmas Tree Suitmeister, and they're going to be one sharp looking jingle ball rocker! 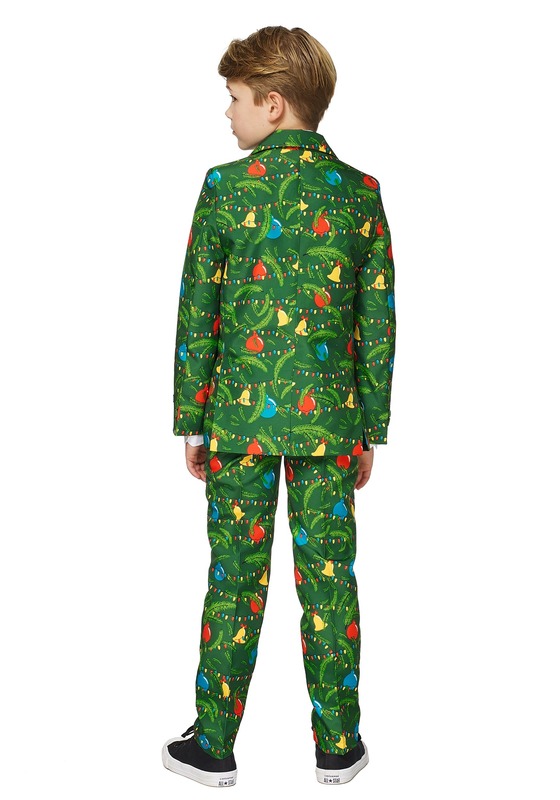 This Green Christmas Tree Suitmeister Suit comes in the style of the now world-famous ugly Christmas suits. You've seen 'em everywhere, and now we've got them sized just right for little guys. That's right this suit is indeed a real suit, sized just right for kids, with suit features. It's fully lined, and all polyester for easy care. And, of course, it's fully printed on the exterior with a Christmas wrapping paper-like design. And the matching tie is included! 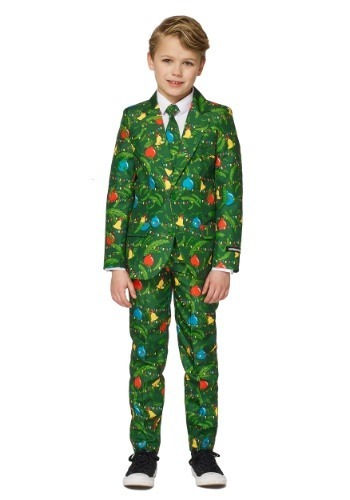 Suit your boy up for Christmas right when you choose this Kid's Christmas Tree Suit. He'll be looking sharp, and kind of looking like a present all wrapped up in the Christmas tree theme. Be sure to check out all of our holiday apparel to outfit your whole family. We've got everything from ugly Christmas sweaters to Santa suits!